As a student of history, I must confess to an overwhelming interest in archaeology. The British TV show 'Time Team' (available on YouTube) is among my favourite viewing, and I follow archeological websites, Twitterfeeds and Tumblr pages with something approaching fascination. People of the Regency era were no less interested in antiquities. The term 'archaeologist' was not often used. The people interested in relics of the past were called 'antiquarians'. During the Regency era, as now, one could seldom stick a shovel in the ground in the British isles without turning up something interesting. 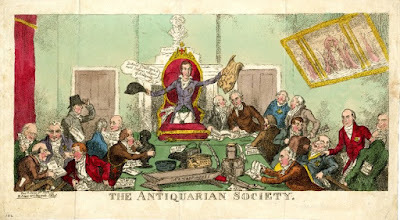 The Society of Antiquaries, later I believe known as The Antiquarian Society, as conceived as early as 1707. 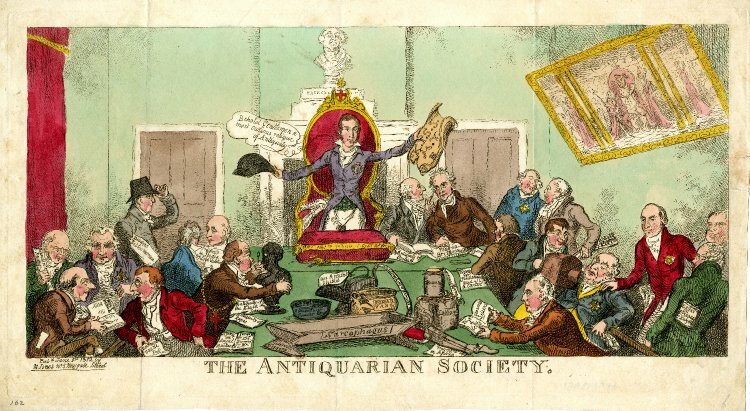 Open to gentlemen with an interest in antiquities, the society was eventually chartered and began to collect objects in its own right. The great interest in antiquities led to the publication of numerous books and periodicals. The work in the advertisement below indicates it will be published monthly, and contain eight etchings in each issue. The antiquarians were delighted and intrigued by every fresh discovery, and the newspapers covered the finds extensively. I do wish that all these finds could have benefited from modern recording and scholarship, but the delight the finders experienced was no doubt equal to the thrill experienced by the archaeologists of 'Time Team'. I am excited to read about any discoveries in any era. Though excavation is destructive, artifacts from the past bring ancient peoples to life and enhance our understanding of them.